Falls International Airport is administered by the International Falls-Koochiching County Airport Commission, which is a Joint Powers board of the City of International Falls and Koochiching County. The airport Joint Powers Agreement reflects the successful partnership of city and county in the creation of a full-service airport. The agreement calls for a commission made up of two members of the International Falls City Council, two members of the Koochiching County Board of Commissioners and a citizen representative, who is nominated by the City Council and appointed by the County Board. Einarson Flying Service, Inc., owned and operated by Thor Einarson and family, has provided site management services at Falls International Airport for many decades. Einarson’s also functions as the airport Fixed Base Operator and provides a wide range of general aviation services. Airport administration is handled by commission secretary Kyra Hasbargen, who works closely with the airport manager, the airport consulting engineers, the MnDOT Office of Aeronautics and numerous federal agencies to coordinate commission projects and project financing. The commission relies heavily on its engineering consulting firm, Short Elliott Hendrickson Inc. of St. Paul, and on the experienced guidance of SEH engineer Benita Crow and SEH Airport Planner Bob Cohrs. SEH provides a full range of engineering services to the commission in the planning and execution of its long-range capital improvements. If you would like to advertise your business at the Falls International Airport terminal, contact the airport secretary at 218.373.1073 for more information. The Commission holds its regular meetings once each month and special meetings as needed. Zoning for Falls International Airport is controlled by a zoning ordinance adopted in 1979. That original ordinance is currently under revision to accommodate changes to the Airport Master Plan and airport infrastructure. As with the Airport Commission, the Airport Zoning Board and the Airport Zoning Board of Adjustment are made up of two members of the International Falls City Council, two members of the Koochiching County Board of Commissioners and a citizen member nominated by the city and approved by the county. The Zoning Board and the Board of Adjustment meet on an as-needed basis. The Koochiching County zoning administrator also serves as administrator for the airport zoning ordinance. Notices of Airport Zoning Board and the Airport Zoning Board of Adjustment are advertised in the International Falls Daily Journal. The Commission is committed to continually make improvements to the airport for our residents, businesses, nearby communities, our Canadian neighbors, and those who travel here for work or to pass through the U.S. Port of Entry. You may view a copy of the Capital Improvement Plan, located on the Minnesota Department of Transportation’s website. Beginning in April 2009, the Airport Commission initiated an extensive and in-depth planning process aimed at determining whether a new building is needed or whether the existing building can be expanded and improved to better serve the traveling public. Conceptual and Schematic Design for the project were then completed. Construction on Phase I of the new Airport Terminal began in June, 2016 and was completed in October, 2017 with the use of Federal, State Bonding and Local funds to complete the project. Phase II is currently in the works and is scheduled to begin in June, 2018 with a completion date of Fall 2019, and the use of Federal and State Bonding funds. The Airport Layout Plan (ALP) also got an overhaul during 2009 – 2010. The ALP was revised to incorporate recently completed construction, including the expanded terminal building parking area and the hangar development area northwest of Runway 4/22. The ALP update also included the addition of newly acquired properties and compliance with updated FAA and MnDOT standards. The ALP is currently in the MnDOT and FAA review process. In 2009, the hangar area north of Runway 4/22 was expanded by constructing a taxilane and automobile entrance road for future hangar development. This site is prepared for private hangar construction south of the taxilane, with future development north of the taxilane contingent on environmental studies and hangar demand. In 2019, the Airport will begin a multi-year construction project to reconstruct the main runway and taxiway. 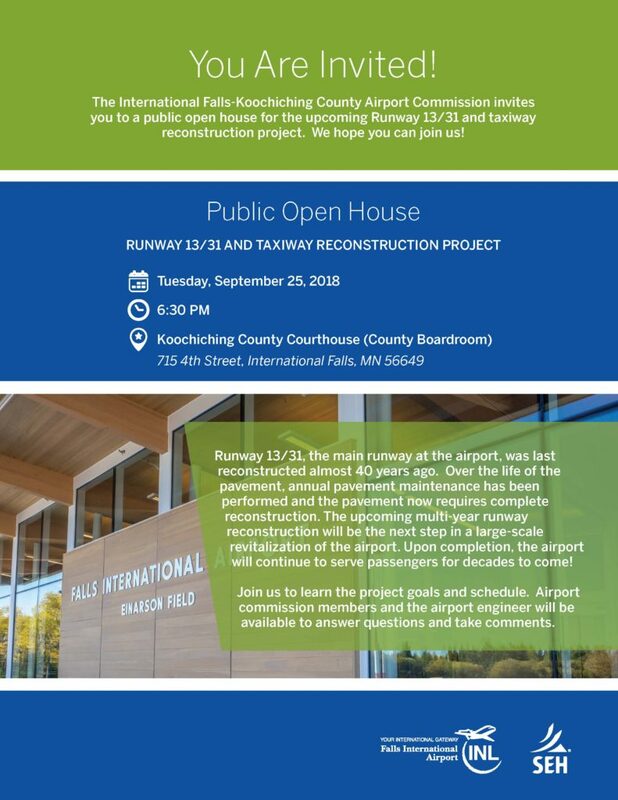 The International Falls – Koochiching County Airport Commission will be hosting an Open House to discuss the many great improvements planned and happening at the Falls International Airport over the next five years. The upcoming event will provide information on the elements of each project, anticipated project phasing and schedule, project funding as well as potential project impacts. 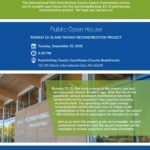 The Open House will be held on Tuesday, September 25th at 6:30 PM in the Koochiching County Courthouse (County Board Room). Please see the attached flyer for additional project information.